Syria, a country of the Middle East, has experienced an unimaginable humanitarian catastrophe in the world history since the inception of the Syrian Civil War in 2011 which turned into a large-scale all-out war. Many war loving natives and foreign entities have joined in this percussion over time. From western democratic countries to autocratic Russia and Iran are also become major participants of this odious war. Bashar Al Assad reached the brink of death losing vast territory of Syria to rebels, mainly ISIS and Kurds. Russian firm and stony engagement in this war from September 2015 in favor of Assad has changed the complex calculations of Syrian battlefield. Assad has started regaining his territory one after another with the massive help of its allies. Now Syrian Civil War has come to its turning point. Idlib is the last stronghold position of the oppositions which is going to be captured with a large-scale offensive by Assad and his allies very soon. Already Russian jets have started bombing in a minimal scale. But the United Nations has warned of “the worst humanitarian catastrophic” in this century, if the attack goes ahead since there is no remaining place for oppositions to flee. As Idlib offensive comes closer, complexities are getting higher. On September 7, Russian President Putin and Turkish President Erdogan ramped up to Tehran in a haste summit where Hassan Rouhani joined over Idlib crisis. Russia, Turkey and Iran have failed to come to an agreement. 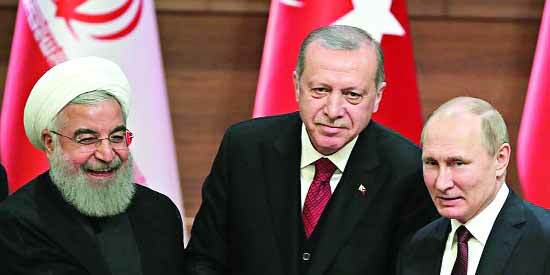 Russia and Iran strongly supported for an offensive to liberate Idlib while Erdogan urged for negotiation and ceasefire as Turkey is concerned about another massive rally of refugees towards Turkish borders. Turkey is already bearing the cost of 3.5 million Syrian refugees. So, further refugee crisis would lead Turkey in warm water. Putin has shown his determination by rejecting Erdogan to strafe Idlib with all means available to him before situation goes beyond Assad’s control. UN estimates that there are 2.9 million people in Idlib among them 1 million are children. Internally displaced rebels, jihadists, extremists have blurred with civilians. 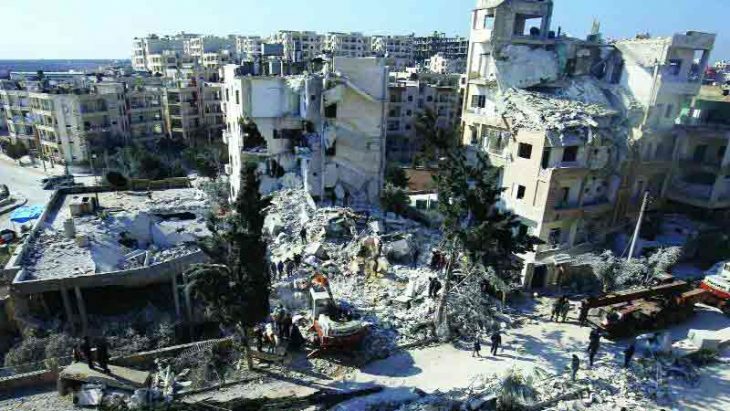 So, any offensive attack on Idlib will create a devastating impact on inhabitants. Turkey has already closed its all borders with Syria. US involvement in the Syrian Civil War could not stop ISIS, and then Russian profound engagement since October 2015 has brought a revolutionary change in Syrian battle ground. Humanitarian cost seems not so important to both Iran and Russia. Trump pledged in his tweet that if there is any chemical attack, USA with its allies will respond. But Mr. Trump’s threat seems full of hoax and those rhetoric words bear less significance to Putin and Assad. Syrian Army is massing around Idlib. Almost 1,00000 soldiers have been mobilized to the north-west of Syria. On the other hand, US and Russian navy with war ships have taken position very closely to each other in the Mediterranean Sea. Erdogan launched massive diplomatic efforts to stop Putin. He was a bit success but it is time being. Russia has already supplied S-300 defense system to Syria in response to curb Israel. It is obvious to say that Putin has specific and consistent road map on Idlib issue. International organizations, including the UN, are predicting a bloodbath in Idlib. 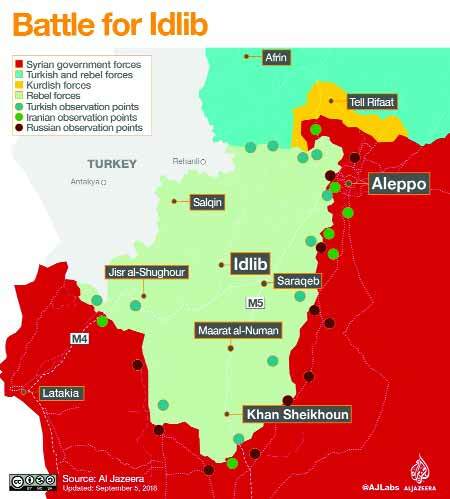 Though it will not be very easy for Assad’s army along with alliance forces to capture Idlib. According to UN data, there are almost 3,0000 militants from many groups who control the whole territory. Turkey backed Hayet Tahrir al-Sham, (UN and USA listed terrorist group) remains the most powerful militant group with 10,000 jihadists. There were huge divisions among militia groups in Idlib. Once they used to take gun against one another, but now they are working hand in hand against Assad regime as war looms. Militants have said that they would fight for life, they do not want back Assad’s control. So, it is obvious that they would use massive force to bring the city under control. Russian massive air strike would be needed for Syrian ground forces to break down Idlib’s frontline. Undoubtedly, Iran sponsored militia groups and Lebanon based Hezbollah will play a crucial part of this war. It is not impossible to seize Idlib for Assad coalition but humanitarian cost will be higher as UN predicts that around 700000 people will be displaced. Infectious Arab Spring compelled long held dictators to pull back. Assad is the man who retained in power, despite grim rivalry from oppositions. It should be acknowledged that Arab Spring was not solely result of internal dynamics of the Middle East but also external influences. Many interest groups have deeply engaged in this war with different agenda and purposes. Foreign interventions are not always motivated by humanitarian reasons but hidden interest of their own. A brief discussion is given covering interest of the major players in Syria. US involvement in the Syrian Civil War could not stop ISIS, and then Russian profound engagement since October 2015 has brought a revolutionary change in Syrian battle ground. 92,006 air strikes have been carried out by Russian air force till last June. It has substantial impact on Syrian politics. Once ISIS seemed invincible to US strategists but Russian war machine wiped out them within two years! Russia saved Assad and continues to support him. For the solution of Syria, Russia participated in UN sponsored Geneva talks and strongly co-sponsored the Astana talk along with Iran, Turkey and Syria. It should be noted that no country spends a single bullet without its own interest. Russia has a lot of different types of interests in Syria. First and foremost is its strategic importance for Russian military strategy. It is undoubtedly predictable that the Middle East would remain an area of major conflicts for decade. Russia has perpetuated its presence in Syria by the establishment of Hmeimim airbase in western seaside province of Latakia and a naval base in the Syrian port city of Tartus. Now Putin gives a strong message to the world that not only USA but also Russia has enough strength to fight in Syria. USA and European Union are using their economic sanction weapon against Russia, but it could not slow down Russian aggressiveness. Scholars are predicting neo-Cold War between USA and Russia over Syrian conflict. Russia also has complex economic interest in Syria. Downtrend of oil price affected Russian economy. Illicit oil business by ISIS and other terrorist groups helped lowering world oil price and that’s why Russia had to prevent it for its economic survival. Russia also sells huge arms in Syria. Russia also invested a lot in Syria before Syrian uprising has taken place in 2011. Turkey has been one of the backers of Syrian oppositions from the inception of civil war. Turkey has been supporting Free Syrian Army against Bashar Al-Assad. Turkey has a long territorial border with Syria. So, it had to engage in this conflict whatever it liked or disliked. Ankara has been a part of US-led coalition in previous time. Now it is one of the major shareholders of the Astana talk. Role of Turkey has been ambivalent under Erdogan regime. Pro-US Turkey U-turned after the failed coup in 2016. USA has been accused of conspiracy with Fethullah Gulen. Erdogan is passing a long span of good time with Putin while US-Turkey relations have reached at a lowest point under Trump administration. Turkey has a different interest in eliminating Kurds because they possess a vast territory of Syria and have a strong position in Iraq. Turkey recently has launched an operation with ground forces named “Euphrates Shield” targeting Kurdish people in Northern Syria. Turkey fears most is a formation of a Kurdish state in the Middle East. Surprisingly, USA patronizes Kurdish military groups like Syrian Democratic Front. Turkey occupied Afrin, a part of Idlib and created safe haven for refugees. Alliance of resistance is now in crisis. Tehran summit was a cornerstone where rift in alliance deemed. Erdogan may again move to western coalition as its border is threatened by further refugee crisis. Syria has become a market place of many entities where everyone has a strategic choice. Humanitarian motives are poorly counted while ideological and power politics matter so high. Iran has significant amount of strategic reasons to intervene in Syrian Civil War. Iran has been a strong backer of Assad regime. From the inauguration of Syrian conflict, Shia populated Iran has been providing extensive support to its another Shia brother, Assad. Iran provided huge aid in the form of training, weapons, advisory and logistics. Iran also deployed a large segment of its elite forces, the Islamic Revolutionary Guard Corps (IRGC), and Shiite militia groups from across the region. Another notable thing is the indulgence of Iran patronized Hezbollah of Lebanon in Syrian Civil War. This group is playing a large part in the game of Assad. Iran is also trying to create deterrence against Israel and Saudi Arabia. Iran is one of the two countries (another is Syria) who has not yet vowed to Israel. So, it is understandable that Iran has a high stake in Syria to perpetuate its military and political presence. Strategically, Syria is also important for Iran to supply weapons through Syria to Hezbollah in Lebanon. Hassan Rouhani is doing his best to play the game with full dedication in terms of Iranian ground forces and resources. Resurgence of Shia is inevitable, since newly formed Iraqi government is also from a Shia affiliated party. Now Shias are unstoppable in the Middle East. Iran has become the strongest leader against Sunni world. Putin’s Russia keeps high scoring in Syrian battlefield while Trump is bombing on others through tweeting. USA could have been the major player in the Middle East but its sluggish incoherent policy backed it underground. Putin’s aggressive tactics almost wiped USA out from the mainstream game. Washington, under Obama administration, had not taken any substantial step in Syria but continued to fund so called moderate militia groups who opposed Assad regime. But this policy totally failed. Trump pledged in election manifestation that he would withdraw US forces from the Middle East. He could not cling to promise. He has not yet come up with robust policy framework. Though once Trump directly attacked on a Syrian airbase in response to use of chemical weapons against civilians by Assad. USA supports Syrian Democratic Forces, an alliance of Kurds and Arabs who used to fight against ISIS. SDF now controls a large area of Syria. Almost 2,000 soldiers, advisors and technicians are supporting them. Maybe they will be targeted by Assad when Idlib game is over. USA still tries to secure its allies interest, especially Saudi and Israel who oppose strong Iran. But now it is unlikely that USA would increase its military presence in the Middle East when Putin gives volley one after another.